Over the last few years I have been so pleasantly surprised by the number of allergy-friendly cookbooks that have been published. These books help raise awareness, promote inclusivity, educate, and of course - nourish. 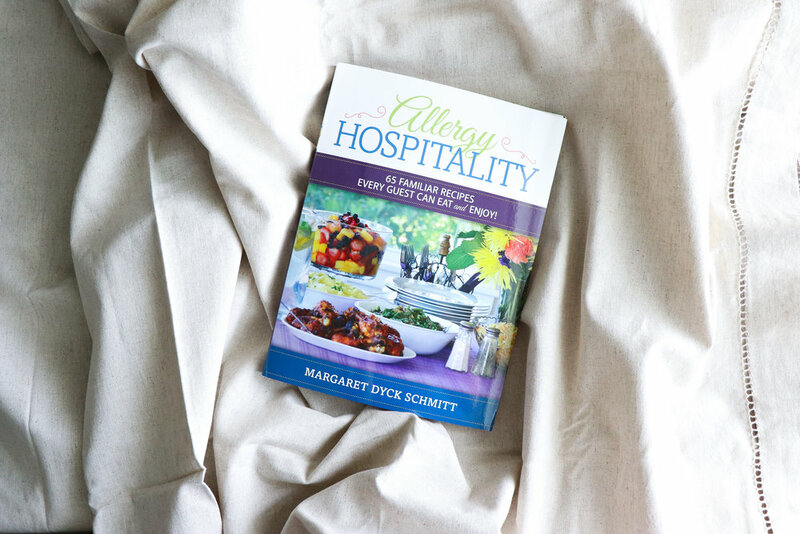 When author and allergy mom Margaret Schmitt of Allergy Hospitality reached out to me about her newly released volume, I was happy to help promote it and to use it myself! Margaret is a mom of 6 and has multiple food allergies to manage in her own home. This book was written based on her own experiences and using her own recipes that she has developed over the years. All the recipes are free from the top 10 allergens and more, so there is certainly something for everyone. Recipes range from simple smoothies and salads, to muffins and breakfast sausages, to heartier mains like rotisserie chicken. In addition to recipes, she has included helpful information about which products she uses and photographs of them for reference. Which brands to buy is such a common inquiry I receive especially from new allergy parents or people who do not have allergies to manage in their own home. She suggests stocking up on safe pantry ingredients so that they are at the ready when you need them. She also presents her strategies for avoiding cross-contact in your kitchen. This is such an important set of rules to know as anyone with an allergy can attest; it's often more stressful to manage the preparation of the food than the actual ingredients themselves. One of the things I love about this book is the warmth you can feel in it. The batch sizes are large, an indicator that she has been cooking for a big family for a long time, but they are practical. Everyone gets a hearty serving. The tips and resources are specific; she's being doing this for a long time and has honed her craft. There are no "specialty" ingredients that can only be found in a couple recipes and will sit in your cupboard never to be used again. The components are practical and simple, and nearly universally available. The recipes can easily be prepared by a home cook with any level of skill. Whether you're just learning to cook allergen-free, or if you've been doing it for years, there's something for you in this book. I made three recipes from Allergy Hospitality for my lunch. First I made a light and tangy cucumber salad with red onion and a vinaigrette (page 96). It's uncomplicated, familiar, and simple without compromising on flavor! I love dill so I added extra, and the dressing had a nice sweetness from lemon juice and maple syrup. This type of salad can be made ahead as the flavors only intensify as it marinates, so it would be a good make-ahead lunch. 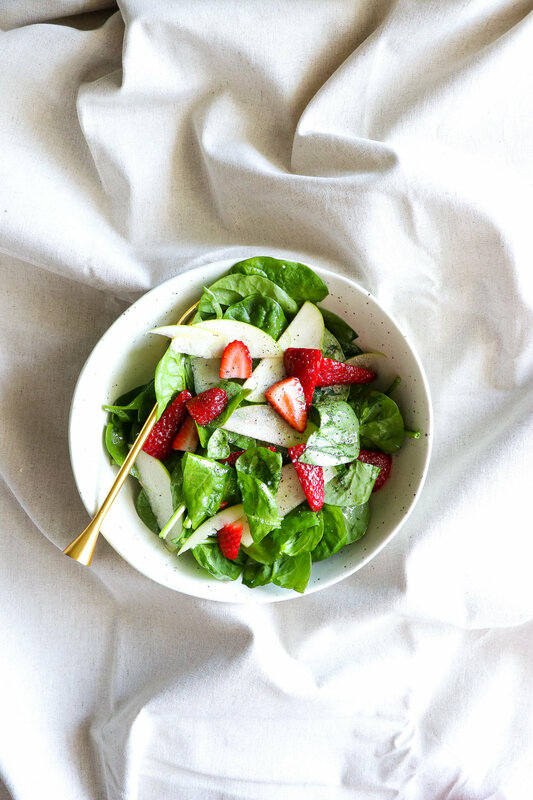 Next I made a sweet and bright strawberry, apple, and spinach salad with a sweet onion dressing (page 112). My mom used to make something similar when I was a kid so it felt homey and familiar. It's not only a very healthy salad but it's cost effective, naturally sweet and tangy, and looks beautiful. Both salad recipes were ready in a matter of minutes and made a fantastic, energizing lunch. I scaled everything down to one serving but the recipes would easily serve a family. Finally, I had to finish it off with a smoothie because I like to have one every day. I made the blueberry banana smoothie (page 8). Again it was bright, healthy, and flavorful. Frozen blueberries are inexpensive and bursting with flavor and nutrition. Banana, blueberries, lemon, maple syrup, and water - it's as easy as that! The cuisine of Allergy Hospitality is a take on classic American food. There were many things that were new to this Torontonian girl! But there are also lots of familiar favorites. Next on my list to try is the overnight coleslaw and Salisbury steak. Pick up your copy of Allergy Hospitality here.